Although they do not claim as much, Werner Ende and Udo Steinbach have under­taken to produce a one-volume summation of all that pertains to Islam in recent times. Der Islam in der Gegenwart is the single most comprehensive discussion available on modern Islamic theology, history, politics and civilization. For this reason alone it holds considerable interest. There is, however, another reason to take note of this volume: the fact that the two editors and 21 of the 27 contributors were born in the 1930s and 1940s. The multitude of authors, the range of their subjects, and the size of their product make this book a showcase for German research on contemporary Islam by the post-war generation. It thus provides a good basis to judge how the new scholarship is faring. But more on this matter later; first, something about the substance of the book. Of the book's three parts, the first and third deal somewhat perfunctorily with historical background and today's culture. Part one touches lightly and routinely on the basic facts of Islam. Part three offers a diverse selection of chapters, including both Otto Jastrow's brief but engrossing essay on Muslim languages and Mohamed Scharabi's embarrassing review of architecture (in which three of eight illustrations display his own — unrealized?— blueprints). A major effort to evaluate recent developments in all parts of the Muslim world makes up the second part. Containing fully two-thirds of the total text, this repre­sents the most ambitious portion of the book. Impressive contributions include the systematic exposition of Islamic social institutions by Johannes Reissner, a schema of Sufi orders by F. De Jong, and an overview of the application of the Shari'a by Konrad Dilger. The heart of Der Islam in der Gegenwart, however, consists of two very long chapters that survey the position of Islam throughout the Muslim world. This is the single most comprehensive account available about the global status of Islam. Noteworthy contributions include chapters by Peter von Sivers on the Maghreb and Peter Hasselblatt on the Horn of Africa. As ever, Duran Khalid's analyses of Islam hold special interest; here he covers Afghanistan, Pakistan, Bangladesh, Europe, and America. The reviewer, having single-handedly attempted a shorter survey of Islam (75 pages long in In the Path of God: Islam and Political Power), especially appreciates how much work goes into collecting reliable information about the status of Islam from Senegal to the Philippines. But my experience brings me to raise several reservations about this survey. First, some of the authors have not brought their accounts up to date. Thomas Koszinowski, for example, effectively ends his chapter on Syria in 1970. What happened earlier in the century can be found in many studies, but information on the l980s is much harder to locate. There are no books on this yet, so the research tools are primarily newspapers and magazines. For precisely this reason, the history of the immediate past has to be supplied in a survey of this sort. There are also shortcomings that result from the book being a collaborative venture. The allotment of space is peculiar, to say the least. Hans Kruse has 12 pages to write on North Yemen and Kerrin Grahn Schwerin has only seven for India; this seems to suggest that the Muslims of North Yemen are almost twice as important or interesting as those of India. And why is there no information about the Muslims of Lebanon, Israel, the Sudan, the Persian Gulf states, Burma, Thailand, and Singapore? These lacunae confirm my doubts about multi-authored surveys. Another drawback of too many authors is that they do not address the same issues. Udo Steinbach introduces the survey with an excellent assessment of the Islamic revival but the authors surveying individual countries write from their own vantage points and pay little attention to his remarks. As a result, the reader is virtually precluded from making direct comparisons between Muslim communities. To return to the matter of current German scholarship: both the strengths and weaknesses of earlier German research on Islam are evident in Der Islam in der Gegenwart. Strengths include extensive use of original source materials, the meticu­lous presentations of facts, wide-ranging knowledge, and caution in interpretation. The weaknesses follow directly from the strengths. Facts are too often left to stand on then own, erudition seems to be an end in itself, and the authors shy away from drawing conclusions. Younger German authors apparently share the older generations' weakness for compiling detailed information and leaving it in isolation, naked of conclusions or demonstrable purpose. Heribert Busse's chapter outlining the theology and history of Islam has not a single thought-provoking idea, either as an aside or in summation. Peter Heine's efforts to estimate Muslim populations around the world are valiant but undirected. The few interpretive chapters, to be sure, do break this mold. Albrecht Noth's ambitious essay on non-Muslim minorities or Rudolph Peters' piece on modern Islamic movements are bold efforts at elucidation. As in the past, German scholars are far from unable to draw conclusions, but are often too modest to do so. 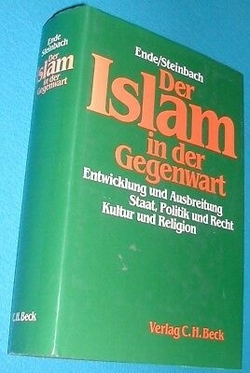 I learned much from Der Islam in der Gegenwart but encountered too few ideas to enjoy my readings. My copy of this study already sits on the shelf between two other quasi-reference books, George Lenezowski's The Middle East in World Affairs and the Middle East Contemporary Survey. As with those, if I found Ende and Stein­bach's book too dense to be read straight through, I am grateful it is there to be consulted.